There are many vacation house rentals in the Colonial Beach area. One visit and I'm sure you'll want to find a place to rent (or buy) for yourself. You'll find lots of different types of vacation house rentals here, from waterfront to inland, from a small lot to acreage. There are a multitude of condos, cottages, townhomes, apartments, bungalows, large single-family homes and even a tiny house or two! The Point is the portion of town that spans from about Boundary Street all the way down to Castlewood Park. Many of the vacation house rentals can be found in this area. Monroe Point Townhomes Directly across from Beachgate Shopping Center, you'll find the Monroe Point subdivision with townhomes - most with a water view - built by Ryan Homes and JL Builders. Rent the Oasis. Shellfield Shores Shellfield Shores consists of a few streets with nice, large homes. Some have large lots and some are directly on the water. 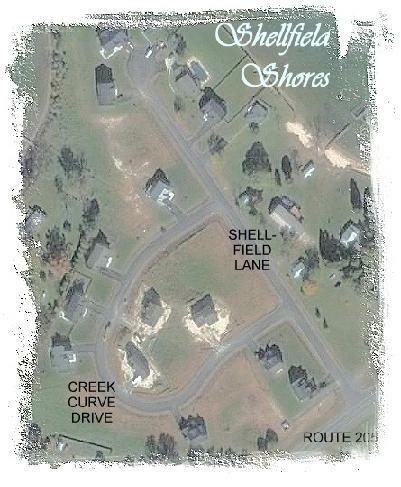 Shellfield Shores is on Route 205 as you're headed out of Colonial Beach. Look for it on your right hand side just past the seafood store. Streets are Creek Curve Drive and Shellfield Lane. Northern Neck Community (http://www.northernneckhome.com/) Northern Neck Community (fredericksburg.com/News/FLS/2006/022006/02282006/171685) is yet to be built, and a portion of it is just across Rt. 205 from Shellfield Shores. From what I've heard and read about it, it looks to become a great family-oriented community with lots of nice homes as well as open space and amenities. It has a lot of frontage along Williams Creek. Lennar Homes - Potomac Crossing (fredericksburg.com/News/FLS/2007/042007/04102007/274397) Situated on 511 acres and slated for 913 residential units (including homes, townhomes and condos), Potomac Crossing was to have had their grand opening in the Spring of 2003. I'm anxiously awaiting plans for this subdivision to come to fruition because the site plat I saw shows all the homes being built around a golf course, which is very similar to the neighborhood I grew up in back when I lived in California. This would also be the first golf course in Colonial Beach. Currently, the closest one is Cameron Hills in King George County, or you can take a boat across the Potomac to Swan Point in Maryland. These subdivisions are all technically in the Oak Grove area, but they use the Colonial Beach zip code (22443). To get to these areas, take Rt. 205 out of Colonial Beach (towards Oak Grove) and continue until you come to Route 3. If you're looking for Placid Bay Estates, make a left onto Ferry Rd. before you get to the stoplight for Rt. 3. For the other subdivisions, take a left onto Rt. 3 and follow for about a mile to a left on Route 664, which is Bowie Road. Make a left at the stop sign if you want Harbor View Colony, go straight across if you are looking for Berkeley Beach, or take a right if you'd like to check out Ebb Tide Beach. Ebb Tide Beach is a lovely community on the corner of where Mattox Creek flows into the Potomac River. There are many waterfront homes, some on the beach and some on the ponds. There are still some choice empty lots, both wooded and clear available where you can build your perfect second home. Vacation house rentals in the neighborhood are available as well. The subdivision features a great private beach area with a Pavilion which is available for parties, a volleyball court, a pier and a screened-in gazebo. Berkeley Beach is the subdivision adjacent to Ebb Tide Beach. In fact, their beach areas are side by side, with a canal dividing them. It is set up in much the same manner as Ebb Tide, and the only difference I have noted is that a lot of Berkeley Beach's streets are gravel roads rather than being paved. 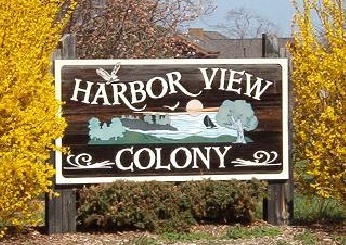 Harbor View Colony is just past Berkeley Beach. There's a complete circle that loops around along the waterfront and the homes in this area are spectacular. Most seem to be built with family fun and entertaining in mind. You'll see one private dock after another, as well as spacious decks and screen rooms to take advantage of the beautiful water views. One of the vacation house rentals here is called Swan Creek. Placid Bay Estates offers many different types of homes, from mid-sized one-level ranchers to behemoth waterfront mini-mansions. Placid Bay also offers a community center and they have their own water company, which has an office in nearby Oak Grove Plaza. If you get hungry after all that house-hunting in Oak Grove, pay the folks at Bobby K's Roadside Cafe a visit. They serve lunch and dinner. They are right there on the corner of Route 3 and Route 664. Closed Tuesdays.